These are Crosby's "original" connecting links, made from Grade 63 steel, which used to be the standard callout for overhead lifting. That is no longer the case, as Grade 63 has been replaced with Grade 100 and Grade 80 chain and fittings. 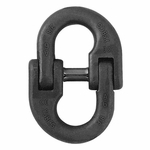 If you wish to use the Lok-A-Loy 6 connecting links on overhead lifting chains, be sure to downrate the sling's capacity accordingly (see the PDF at right for more information). Even better, upgrade to the Crosby A-1337 Grade 100 Lok-A-Loy Connecting Links, which are fully rated for use with Grade 100 or Grade 80 chain systems. Aside from overhead lifting, A-336 links are commonly used with lower grades of chain, including Grade 70, for basic repairs and splices. They are also used to make netting assemblies and feature wider interior throat opening dimensions than standard coupling links. Made from forged steel, Quenched and Tempered. Individually proof-tested at 2-1/2 times Working Load Limit with certification. Safety factor of 4:1.